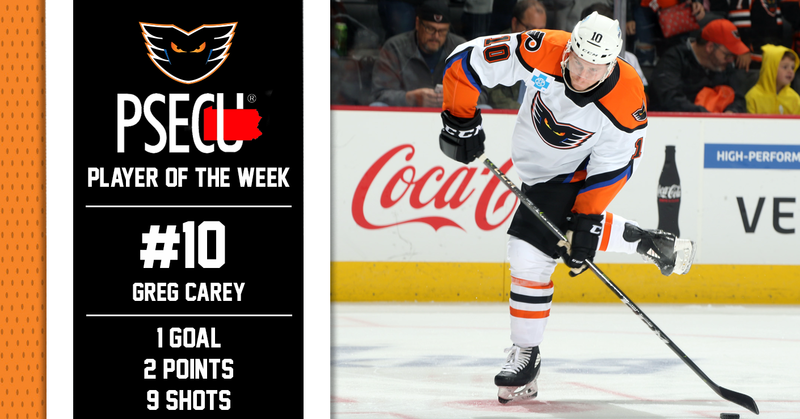 Lehigh Valley, Pa. — After netting the game-tying goal with just 23 seconds remaining in Saturday night’s game against the Springfield Thunderbirds — which the Lehigh Valley Phantoms would go on to win 5-4 in a shootout — and tying for the team lead in shots, Phantoms forward Greg Carey has been named the PSECU Player of the Week for the first time this season. Despite a 7-0 setback against Springfield at home on Friday night, Lehigh Valley bounced back on the road to spoil the Thunderbirds home opener and take the second half of the weekend home-and-home series. A back-and-forth affair through two periods, the two teams were tied at two heading into the third period. After killing off the remainder of a double minor to begin the period, the Phantoms found themselves behind after a pair of goals scored by Blaine Byron and Paul Thompson — just 22 seconds apart — quickly made it 4-2 in favor of the opposition. With under three minutes remaining in the game, rookie David Kaše sparked Lehigh Valley’s comeback when he potted the first professional goal of his career thanks to a centering feed from Chris Conner. His goal made it 4-3 with just 2:23 left in the game. Exactly two minutes later, at the 19:37 mark of the third period, Carey would would find a rebound off of a Philip Samuelsson shot and bury it to tie the game. In two contests this weekend, Carey was tied for the team lead in shots with a total of nine. The 28-year old from Hamilton, Ontario, now leads the Phantoms with three goals and five points on the season. The Phantoms return to the ice inside of PPL Center on Friday, October 19, when they take on the rival Wilkes-Barre/Scranton Penguins for the first time this season. Friday night’s game will also be Hat Trick or Treat Night featuring a spooky Halloween theme and a Phantoms ball cap giveaway presented by Service Electric Cable TV & Communications. Tickets are still available for the game, you can get yours online by clicking HERE. ← Phantoms Rally From Late Two-Goal Deficit For Comeback Win!